Today there are many groups of people around the world praying and meditating for Peace and you can join them . . . Simply take a minute or two out of your day to clear your mind and hold a vision of peace for all humanity. I purchased this kit several months ago and had forgotten all about it until yesterday. 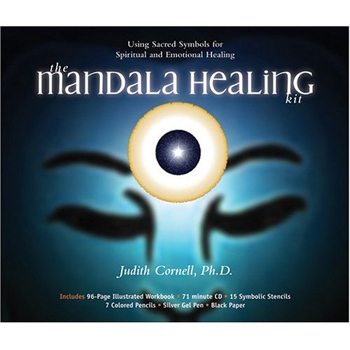 The kit contains pictures of mandalas, colored pencils, a guided audio CD, a 96-page workbook, stencils and special paper. This kit is one of life’s little gems and nurtures one’s spirit in many surprising and amazing ways . . . I had to abandon the idea of the superordinate position of the ego. … I saw that everything, all paths I had been following, all steps I had taken, were leading back to a single point — namely, to the mid-point. It became increasingly plain to me that the mandala is the centre. It is the exponent of all paths. It is the path to the centre, to individuation. … I knew that in finding the mandala as an expression of the self I had attained what was for me the ultimate. – C. G. Jung. be called the archetype of wholeness. May your Holidays be filled with peace, love, joy, good health and the warmth of family & friends. 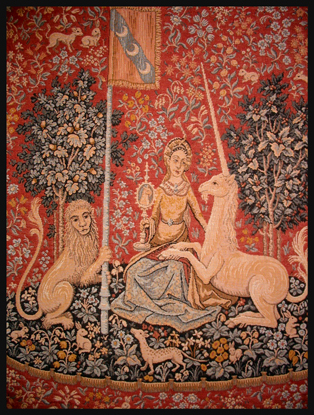 Photo of “The Lady with the Unicorn”. O the Ivy O, she’s the Queen of old, and the Holly he is red. Hang ‘en high in the farm, and us won’t come to no harm Till the Christmas days be told. – Old Somerset Carol. December is the darkest month of the year and many of us experience sadness and depression as the days grow shorter and the nights longer. On the Winter Solstice, it’s as if the earth holds it’s breath during this time of transition between dark and light, cold and warmth, shortage and abundance, life and death. 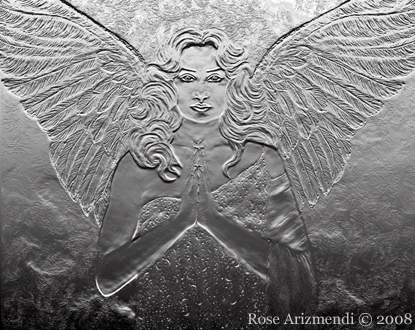 The cold, dark, gloomy days may make us feel that the darkness is ever closing in, tightening it’s grip on us, yet the wheel of the year is now turning toward the light, so gather your loved ones close, read stories to one another, light candles, celebrate with song, food and give thanks for everything you have. It’s been a rather busy day and I am looking forward to a hot bath and a good nights sleep. Celtic Woman is one of my favorite all time groups and I love listening to their music. Here’s one of my favorite Holiday songs performed by the group.